Continuing my series of code that I’ve written in the past, and stuck up on Github, but never actually talked about…this post is about PyMicrotops: a Python library for processing data from the Microtops Sun Photometer. 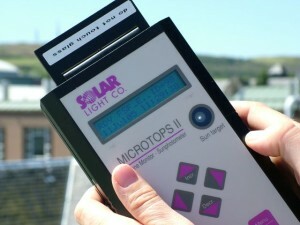 The Microtops (pictured above) measures light coming from the sun in a number of narrow wavebands, and then calculates various atmospheric parameters including the Aerosol Optical Thickness (AOT) and Precipitable Water Content (PWC). The instrument has it’s own built-in data logger, and the stored data can be downloaded by a serial connection to a computer (yes, it’s a fairly old – but very good – piece of kit!). I’ve done a lot of work with Microtops instruments over the last few years, and put together the PyMicrotops library to help me. It’s functionality can be split into two main parts: downloading Microtops data from the instrument, and then processing the data itself. Changing the port (you may want something like /dev/serial0 on Linux/Mac) and filename as appropriate). All outputs are returned as Pandas Series or DataFrames, and if you want to do more advanced processing then you can access the raw data read from the file as m.data. PyMicrotops can be installed from PyPI by running pip install PyMicrotops, and the code is available on Github, which is also where any bug reports/feature requests should be posted.